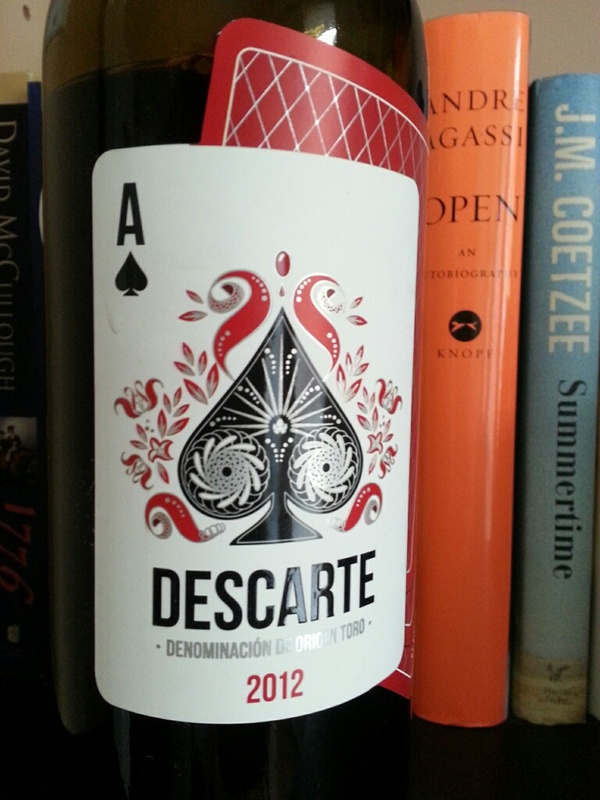 The Wine Advocate gave this 92 points. Seriously! It’s good. We liked it. Hell, I bought half a case. 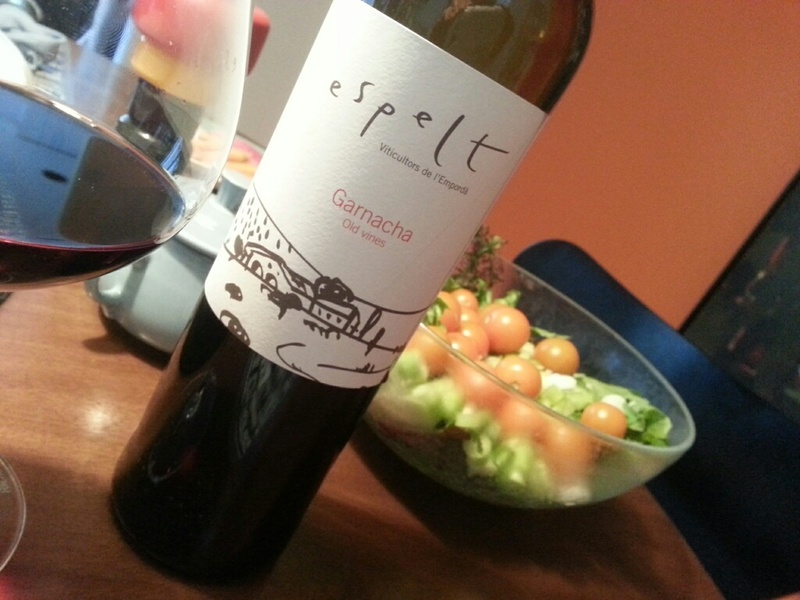 But this is a Tuesday night wine with radicchio and pancetta risotto. It’s not a 92 point wine. 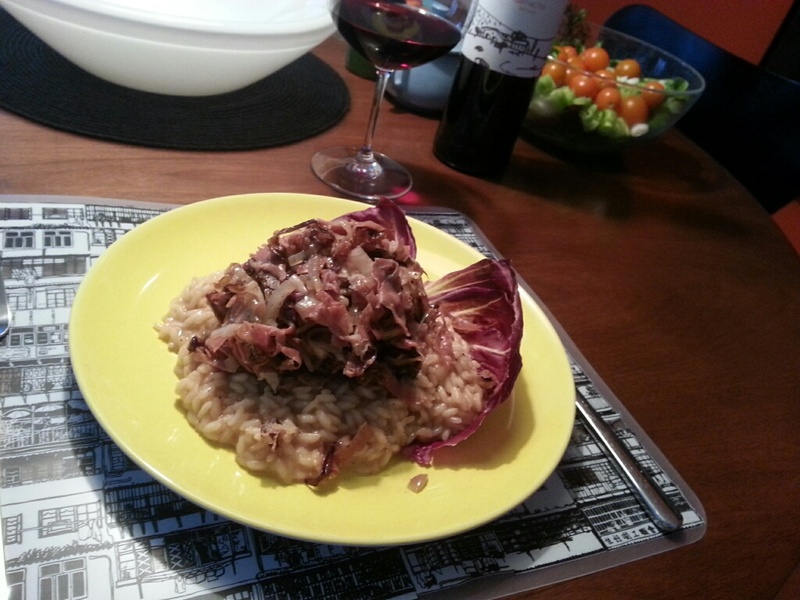 You saute onion and pancetta, then braise radicchio. Set aside. Make risotto. Top with radicchio. Heaven. The WA talked about copious aromas of raspberry jam, black currants, kirsch, flowers and forest floor. I’m not certain what forest floor is but there is lovely (although not copious) amounts of the rest. It needs air, it needs time, and I reckon a year or two more in the cellar even at five years down the road. Price: Here’s the deal. A place called Pete’s in Seattle, wonderful wine store, had six bottles on sale for $58 USD. The WA had a rave review. You know how it goes. So I thought what the heck. Then, however, I had to pay the EXTREME Canadian duty and taxes. You can buy marijuana in Vancouver right, left, and centre, but god forbid you drink a bottle of wine, it’s ding ding ding. So when you factor in all the “penalties” as well as our crap dollar and heavy exchange, one bottle came out to nearly $30 CDN, three times what a Seattle buyer paid. At that price, I think there is better value red, even just Grenache getting dusty at BCL. But congrats to the lucky WA buyers. Market Liquidity: Base hit, no homer. Something happened to Sauvignon Blanc. Something not good. Something like what happened to food when every chef and his dog was deconstructing classics and reimagining what needed nothing more than good ingredients and a deft hand. Was it in the 1980s? Or the 1990s? Or just a few years ago? Something happened between, at one end, Sancerre, and at the other end, the New Zealand vanguard, where growers around the world fell into a craft SB vortex, dizzily “greening” and upping the ante on what used to be subtlety. Half the SB at BC Liquor is like chewing hay. SB used to be one of my favorite varietals. Now it’s almost always a show-off, preening to compete. 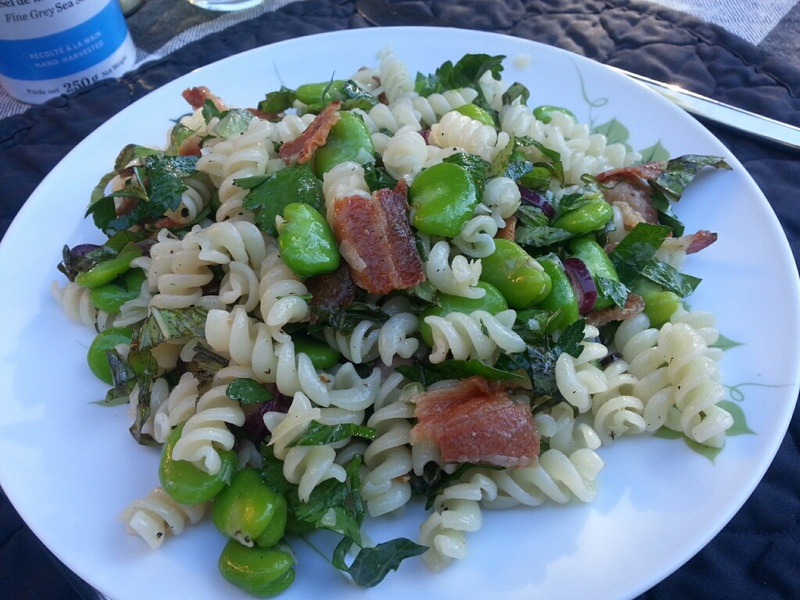 Fresh herbs, applewood bacon and fava beans on quinoa pasta. 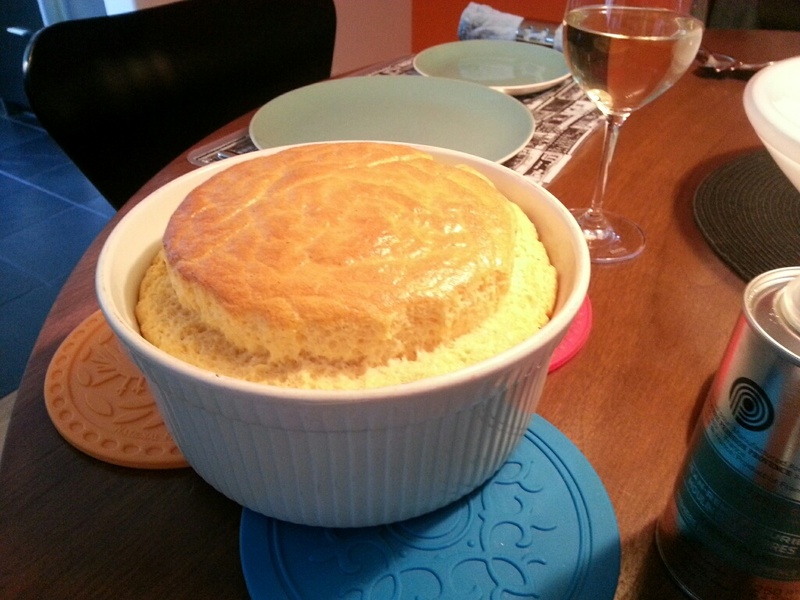 Sorry Errazuriz, dinner was excellent, the wine so-so. Yeah, OK. Here’s what you’ll actually find under the screw top: Something so austere it could be a Gregorian chant by Hildegard von Bingen. Dry as the Mojave. Refreshing? Maybe like running through a sprinkler, incidentally refreshing. Aromas is too generous as a descriptor. Reviewers commonly talk about the attack; this is like alum, like full on citrus pith. “Bright” acidity? Ever heard of Citricidal? It’s like that. The honey note is something of a prank. It’s not a bad wine, I guess. But ohmygod is it making an effort. As we sipped it I couldn’t help but see little girls dressed up to look four times their age at one of those deer-in-the-headlights beauty pageants. Price: Under $20 at BC Liquor. Market Liquidity: Pretty, but not pretty good. South Pender Island lies along the Strait of Juan de Fuca, abutting the meandering nautical Border Pass which dips below the 49th along the US and Canada. East across Plumper Sound, even further south, is Saturna Island. Both have young-ish vineyards. 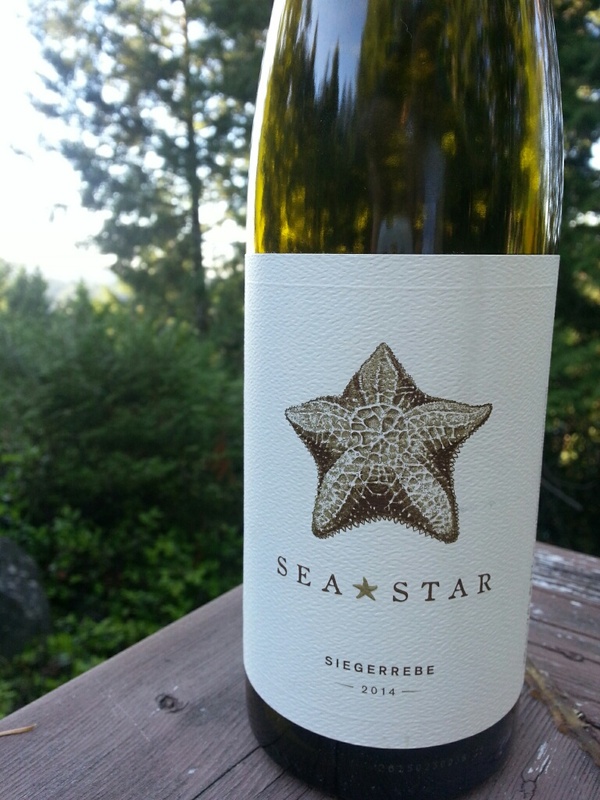 Sea Star at Pender comes out of the gate with a select selection of light, aromatic, appealing whites at an extremely reasonable price point. Meanwhile Saturna Vineyard sits fallow for the second year in a row. Hence the strange goings on in the BC wine industry; whether to strive for the most common, most loved, most drunk varietals (i.e., as Saturna did, and more or less drain the gas tank doing so) or to simply embrace terroir and go for what’s likely to produce good plonk. Kudos to Pender. The Siegerrebe is a Gewurtz cross hybrid, something I’ve never knowingly drunk before even though I’ve seen the Gray Monk; it was reminiscent of the first time I sipped Summerhill’s Ehrenfelser. In other words wonderfully different and immediately interesting. The label proclaims light acidity when in fact we found it heavy handed; it proclaims stone fruit but instead we found it strongly tropical and too ripe, like lychees in sugar syrup. There was a bloom of herbaceousness as well; think winter savoury, a sort of brighter, stronger more floral version of thyme. None of these comments are meant as negative. 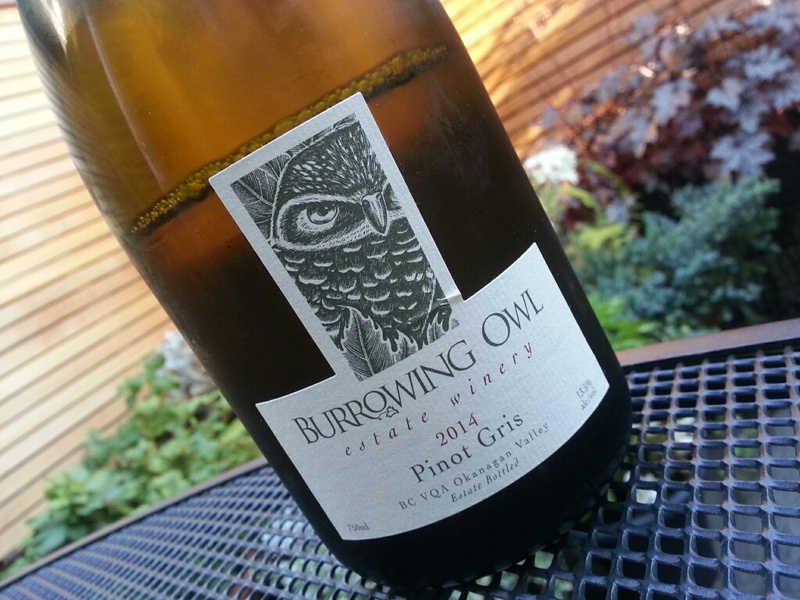 It’s a wonderful summer sipper, I carted a bottle nestled in cool packs on a two hour hike all the way to remote Taylor Point on Saturna, and we drank it with cheese, fruit, fresh homemade soda bread while watching eagles and orcas overhead and beyond. The low alcohol point is an extra feather in its cap. Price: $21 at the Saturna Island General Store of all places. Market Liquidity: Mazel Tov to Pender. 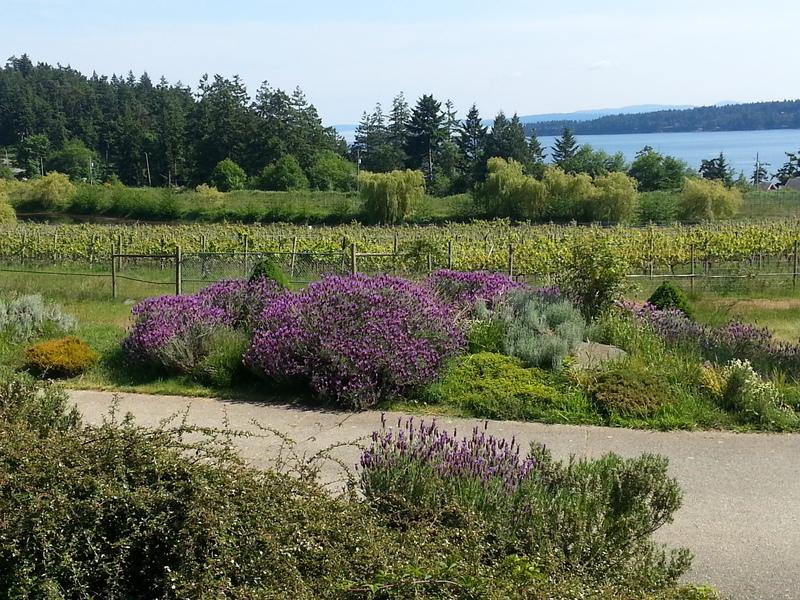 The gorgeous view from the bistro (closed) and the Saturna vineyard (fallow). Sigh. Market Liquidity: Potpourri, I should point out, can be stale, overwhelming and even repugnant.